Homeowners across North Carolina choose propane as their primary energy source for so many reasons. If you heat with propane and live within our service area, choose Ormond Energy as your propane provider to get top-quality fuel service and low, competitive rates. Whether you already power your home with propane or you’re considering converting, take note of its many impressive advantages. Propane meets all clean air standards set by the Environmental Protection Agency (EPA). It is naturally non-toxic, insoluble in water, has minimal emissions, is colorless and odorless, and will not harm soil or water. Propane can be used for a variety of daily applications in both residential and commercial settings, including central heating, fireplace heating, cooking, equipment fueling, and more. Thanks to its many year-round uses, it is incredibly cost effective. Propane is established as a safe way to produce heat by the National Fire Protection Association (NFPA). It is highly regulated by strict safety standards to keep homes and businesses safe. Learn more about propane safety with these helpful tips. 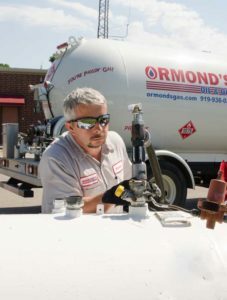 Ormond Energy is committed to delivering every propane order safely and on schedule. However you choose to order your fuel, you can count on our team for dependable service from season to season. Leave your propane supply to the experts! Simply sign up and we’ll take care of the rest. Ormond Energy will monitor your tank levels based on daily usage and factors like property size and number of household appliances to accurately estimate when you need your next fuel delivery. If you prefer to place orders manually, no problem! Call our office or request your next delivery online. Will call customers are responsible for monitoring their tank gauge and placing propane orders accordingly. We recommend that you schedule your next delivery before your tank reads ¼ full. Contact us to become an automatic delivery customer or schedule your next propane order today!